The call center business is one of the most competitive industries regarding increasing sales, retaining customers, and optimizing call center performance metrics. Call centers use key performance indicators (KPIs) to measure the activities and performance of their call center agents, and there are both plenty of them to choose from. Here, I will give you the five best KPIs for call centers working with outbound telemarketing and telesales. Why are call center metrics important? It is important for your business to identify and track the best KPIs for your call center based on the outcome you want to achieve. Identifying and tracking KPIs should lead to improved telemarketing performance. Logically, there is no point in spending time identifying KPIs and measuring them if they are not put to good use. It is important to look at multiple KPIs in the right context. Simply being aware of a call center KPI is not enough. Ultimately, our goal at Plecto is that our customers keep their performance in perspective at all times and that the employees engage with each other and each other’s numbers. If an employee breaks the scale, for example by having the lowest talk time with the highest number of sales, naturally, everyone would like to know how he did it. Your telemarketing performance metrics gives your employees an indication of their performance, on where they should be and how they can improve. This keeps them motivated and at the end of the day, we all need that feedback! Call centers like JO Marketing track KPIs for call center agents in real-time. 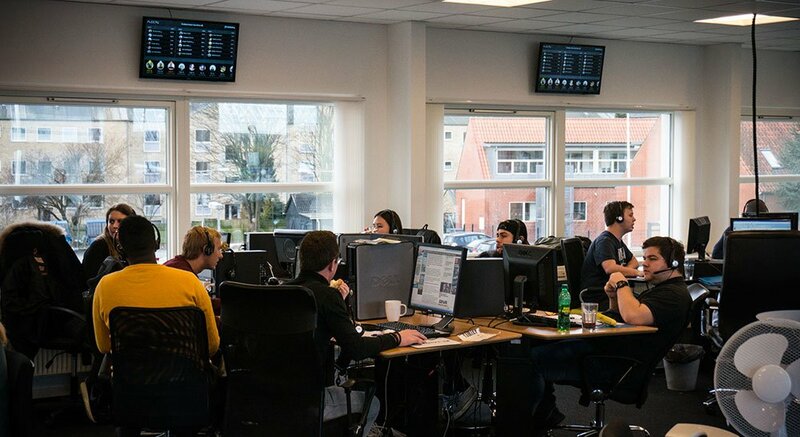 They display telemarketing metrics like call completion rate, outbound telesales KPIs and call duration on TV dashboards throughout their office. In my position as Customer Success Manager at Plecto, I often get to assist customers with getting started with their call center dashboards for tracking key performance indicators for either inbound or outbound. The questions I get mostly relate to how to visualize KPIs in call centers in a meaningful and inspiring way for the employees in order to boost their performance, to enhance their motivation, and to increase sales. What is the most important call center KPIs and outbound telesales metrics? How can I visualize my telemarketing metrics on a call center KPI dashboard? Which outbound call center performance metrics can motivate call center agents? These are the exact questions that I often get from customers running an outbound call center or telemarketing agency, and it is these that have inspired me to write this blog post. If these are some of the questions that you are also facing, then feel free to reach out. Get started with your own call center dashboard for free right here, and I will be ready to help you set it up. I have collected five great KPIs for telemarketing and telesales. The idea is to inspire our customers in what to visualize and how to visualize it on their call center performance dashboard. I have not put them in any order, and I’m sure that they are not too exhaustive. But first, I would like to pinpoint that I generally advise call centers to go with a simple setup and to visualize the same set of data in different ways, for example using different widgets. Keep the data realistic and measurable: The goal should be achievable and clearly defined. It is a good idea to work with different timeframes. Break down the target into smaller sub-targets or work with a daily, weekly and monthly dashboard. The key is to benchmark the performance and measure on a daily, weekly and monthly basis. If you have a large business and doing lots of calls, you can also consider hourly-based KPI tracking. This is obviously one of most important KPIs in telemarketing. But you’ll need to know how many calls and how to count them. There are different outcomes of calls; for example, voicemail, dead number, receptionist and decision-maker (customer). You should take these outcomes into consideration: What outcome do you want to measure on? In relation to the latter, you could consider measuring on the following: Answered calls, duration of answered calls, and the number of calls made by each sales agent. You can visualize this KPI on your call center dashboard from Plecto in a ‘Number Box’ in order to display the total number of calls made for the entire team, or you can visualize it in a table and show calls per sales agent. Calls per sales agent define how often your agents are on a task. This will tell you the level of activity among your employees. This information can help you determine when it is important to motivate your teams with a sales contest. Here is an example of a call center dashboard from Plecto displaying some of the best call centers performance metrics. Naturally, sales are also one of the absolutes. You can measure your sales vs. a target in order to motivate your sales agents. When assessing the success on this metric, you’ll need to know how to measure this percentage; on a daily basis or monthly? However, the monthly target can seem a bit overwhelming at the beginning of the month. You may consider showing the daily progress instead of monthly with the speedometer widget and thereby create a better overview for your employees. ... or a different desired goal or outcome. In some cases, you may need to measure the rate of sales per hour or day depending on the difficulty of the task and the length of your sales cycle. Whatever the outcome, you need to measure those meetings booked and those that have been held. And how many appointments held actually ends up with as a success? This is another useful benchmark. How many calls does it take to get a result? This is the Hit Rate and can be used to define how successful your employees are. The Hit Rate is calculated by dividing the number of calls by the number of sales, appointments, answered calls, or whatever else you may consider a successful result. Did you know that it takes 8 cold call attempts to reach a prospect? Research by Telenet and Ovation Sales Group shows that in 2007, it took an average of 3.68 attempts to reach a prospect. Today, it takes 8 attempts. Cold calling can be tough and demotivating, so your employees need to be persistent and determined. But it can be hard to stay motivated if they reach a voicemail or gets a rejection over and over again. This is where Plecto comes into the picture. 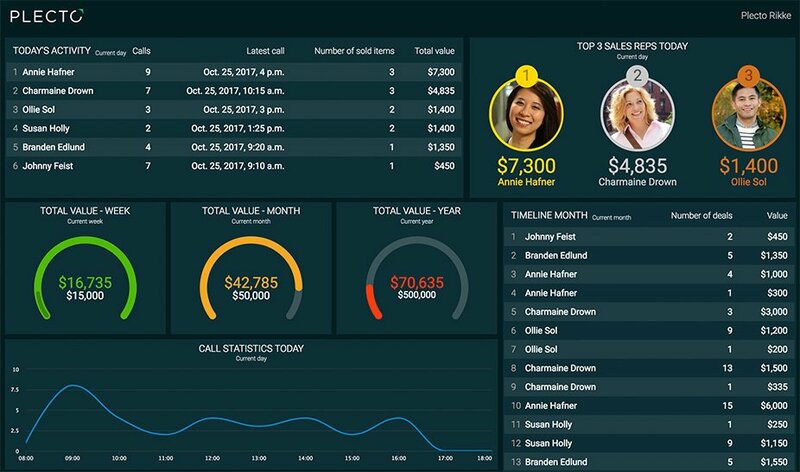 With real-time call center dashboards, you can keep track of your agents performance across the office. You and your sales team is provided with a unique overview where every result is rewarded and recognized – immediately and authentically. Plecto transforms how your call center agents are motivated using gamification and peer-to-peer recognition. Have your call center agents motivate each other and create a culture of support, collaboration, and achievement. Motivated agents perform better and Plecto is what motivates them. Want to know more about engaging and motivating your employees?